There is nothing more comforting than snuggling up to a teddy bear. As it turns out, this isn't exclusive to human babies: monkeys can get in on the action too! Sausage is a baby gibbon who proves this to be the case. She currently lives at the Endangered Primate Rescue Center in Vietnam. The Center's staffers said Sausage was orphaned due to poaching. 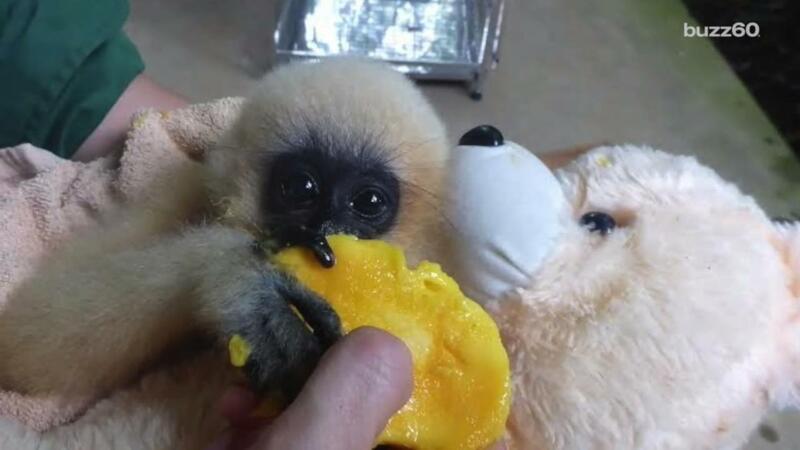 Poaching of gibbons usually happens for their meat and fur, according to Humanima.com. Luckily for the five-month-old monkey, she has found a safe and caring place where she doesn't have to worry about violence. She has all the food and love she can handle at the shelter, plus her new best friend! Sausage loves her teddy bear so much that she doesn't even want to do anything without him! With the addition of Sausage, the EPRC has a total of five baby primates that need to be hand-reared. While it may be a lot of work, it is very important for the well-being of these animals. This is especially true when it comes to critically endangered animals like Sausage, who need all the care they can get!